Daniele Caminiti was born in Messina, Italien. He graduated in classical guitar at the Conservatorio in Pescara. He studied for three years with Oscar Ghiglia at the Music Academy in Basel, where he obtained the Concert Diploma with the honor excellent. As soloist he has won many prizes in various national and international competitions. 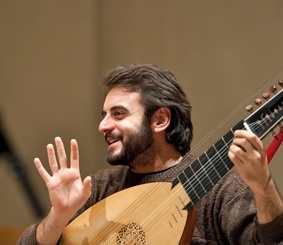 He has dedicated himself to the study of early music played on historical instruments such as archlute, theorbo, baroque and romantic guitar. He studied with Peter Croton at the Schola Cantorum Basiliensis, where he also worked for several years as official accompanist on plucked instruments. His intense musical activity includes performing as soloists as well as chamber musician in important ensembles and orchestras, often playing with renowned artists, such as Andrea Marcon, Ottavio Dantone, Chiara Banchini, Marc Hantaï, Rubén Dubrovsky, Sergio Azzolini, Antonio Politano, Alfredo Bernardini, Jesper Christensen, Jörg-Andreas Bötticher, Pierre-André Taillard, Michael Hofstetter , Attilio Cremonesi, Bernarda Fink, Maria Cristina Kiehr, Andreas Scholl. During the last years Daniele has also made numerous recordings for some of the most labels: Rai Radio 3, Deutsche Grammophon, Decca, Schweizer Radio 2, Channel Classics, Österreichische Rundfunk, Deutche Harmonia Mundi, Sony BMG, Pan Classics, Glossa, Tactus, MV Cremona. He regularly plays, both as a soloist and continuo player, with many baroque ensembles and orchestras, such as Venice Baroque Orchestra, Brixia Musicalis, Accademia Bizantina, Ensemble 415, Bach Consort Wien, Kammerorchester Basel, La Cetra, Capriccio Basel, Zürcher Barockorchester, Holland Baroque Society, Hessicher Rundfunk Orchester, NDR Orchester.